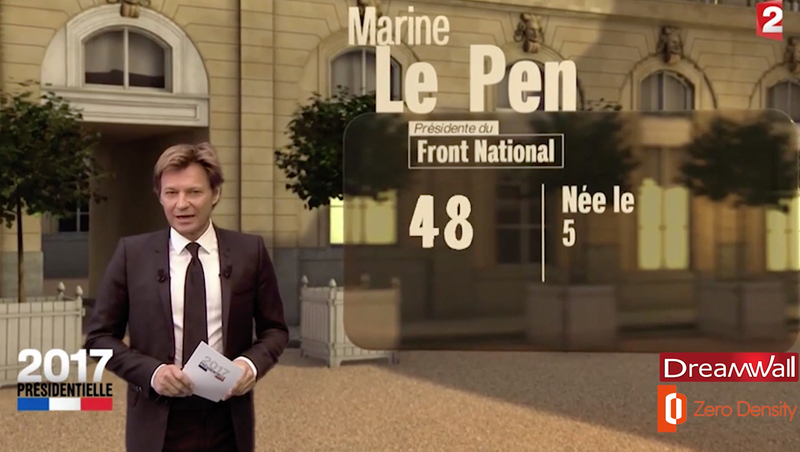 For its coverage of its country’s election over the weekend, France 2 used a combination of a working newsroom set with a large immersive chroma key area that allowed its presenters to step into interactive virtual and augmented reality scenes. 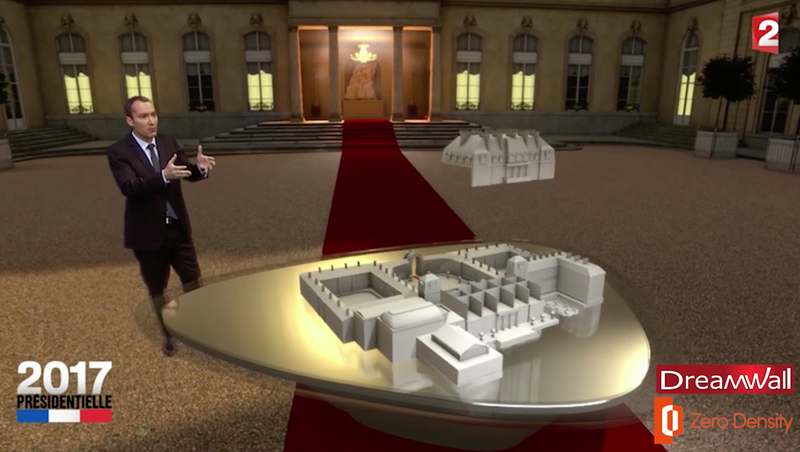 For its coverage, anchors were placed into 3D models of both the exterior courtyard and interior of Élysée Palace with interactive data and elements mixed in. Dreamwall created the high quality models and integrated them with Zero Density’s augmented reality software and technology. The models were able to achieve enhanced realism through Epic Game’s Unreal Engine. 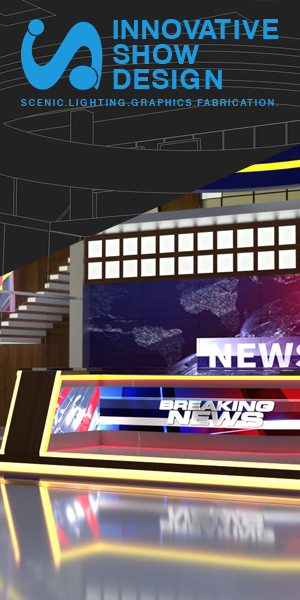 The 3D models also integrated floating graphical data and virtual imagery of candidates in composited lineups. 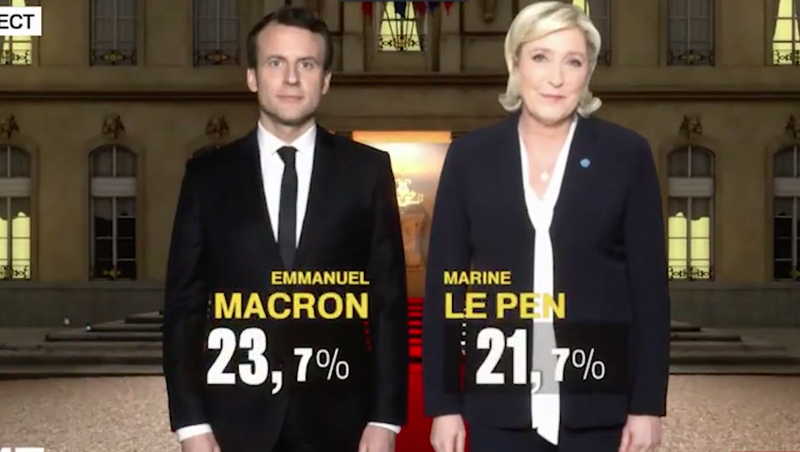 The candidate images were also combined with real-time voting data showing the close race. 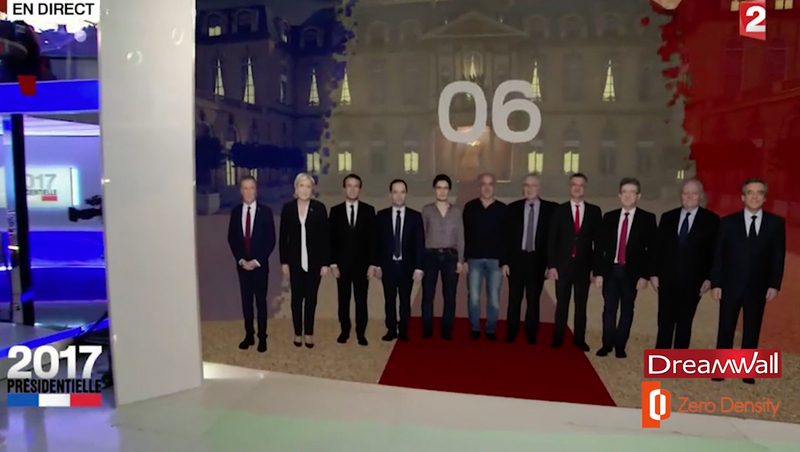 The network also used virtual models of governmental buildings placed on a virtual floating metal surface. The buildings themselves were interactive and floors could be “removed” to illustrate various areas of the structure. 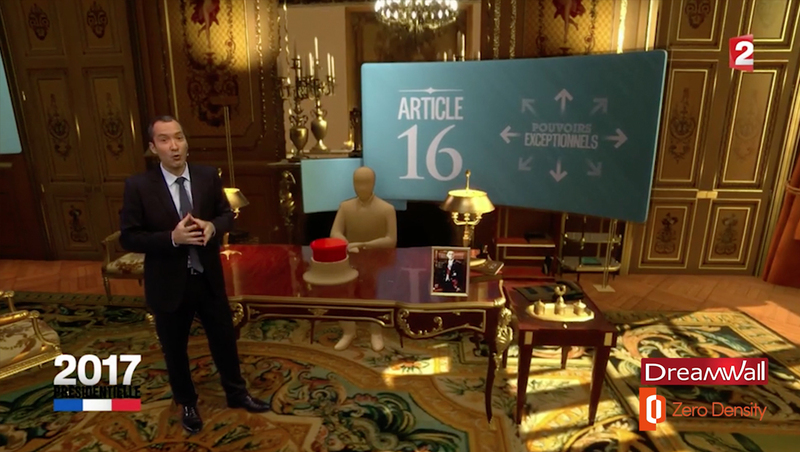 In addition to the Élysée courtyard, the network also used an interior of the president’s office, which could have float curved panels inserted to showcase data and information. 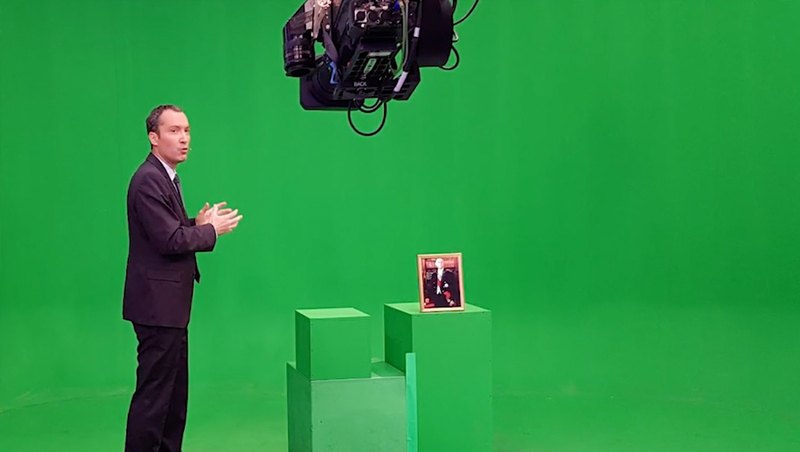 By using a simple television trick of placing a real framed print on a chroma key green-painted box, the presenter could even pick up the frame and carry it around the otherwise virtual space. 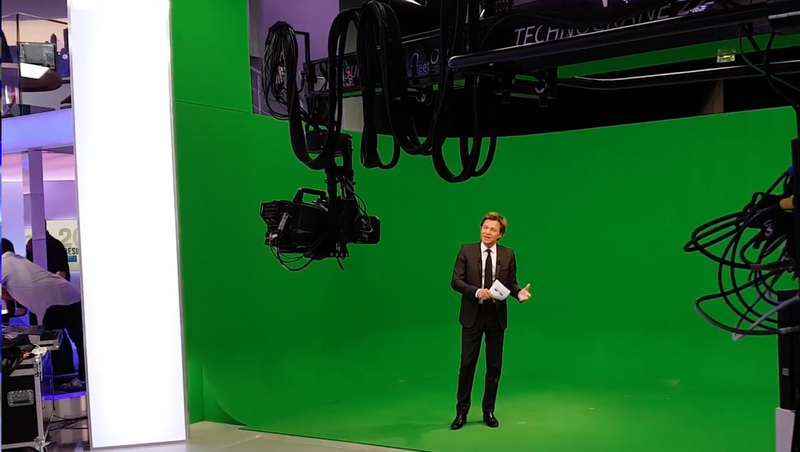 The network also utilized a “real” working newsrooms-style set with augmented elements that was adjacent to the chroma key area, designed by Studios 40. 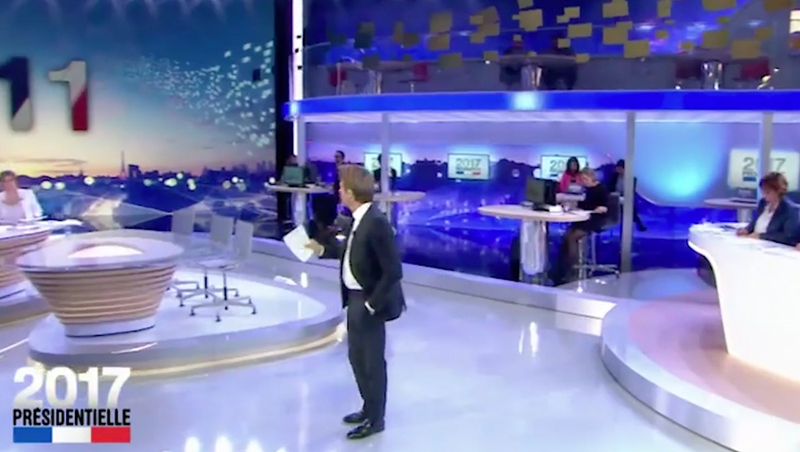 Often sweeping shots would show the set before the camera panned over to the chroma key area with a graphic inserted in real-time, a technique that made the two spaces connect — if only virtually.